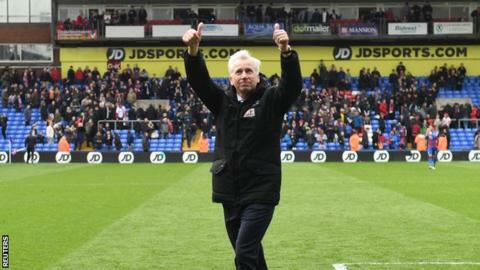 Crystal Palace manager Alan Pardew says he hopes to begin discussions over a new contract at the end of the season. Pardew became Palace boss on a three-and-a-half-year deal in January 2015. He led the club to 10th in the Premier League last season, but the club have struggled in the second half of this campaign, slumping to 17th from fifth. "Once we're safe hopefully I'll sign a new contract here, because I want to stay," said Pardew, who spent four years playing at the club from 1987. Palace, who play Watford in the FA Cup semi-finals on 24 April, beat Norwich on Saturday for their first league win since late December. Back then they were just outside the Champions League spots. Victory moved them 10 points clear of the relegation zone, and on Wednesday they host Everton, who are two points above them in 14th. "We weren't expecting that run to go on as long as it went on," Pardew added. "The first half of this season we got it right, but the second we haven't. We need to address that. The confidence levels, hopefully, have gone up, and our nervousness has disappeared."